Shoot still and movie images better with the iGadgitz dual use portable travel mini tripod and pistol grip stabilizer. Not suitable for iPhone 6 Plus and 6S Plus 5.5″. The removable phone Adapter mount is retractable and can fit mobile phones with 56-85mm wide screens. Made from reinforced plastic with rubber padded inner to keep your phone safe and secure during use. Device can be mounted vertically or horizontally. Without the bracket, the stabiliser/tripod is also suitable for most types of digital camera: SLR, DLSR and digital cameras with standard 1/4″ screw thread fitting. Lockable head positions in tripod mode (up to 110 degrees), together with rubber feet for more stability. Adjustable joints to transform from tripod stand to an ergonomically designed pistol grip to reduce camera wobble and offer better pictures or video. The iGadgitz 2 in 1 Pistol Grip Tripod is a great accessory for your smartphone. It weighs only 85 grams and its pocket size makes it perfect for travel. 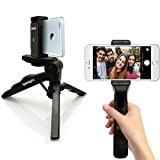 This entry was posted in Discount Photography and tagged Apple, Bracket, Grip, iGadgitz, iPhone, Lightweight, Mini, Mount, Phone, Pistol, Stabilizer, Stand, Table, Tripod by Ball Photo. Bookmark the permalink.